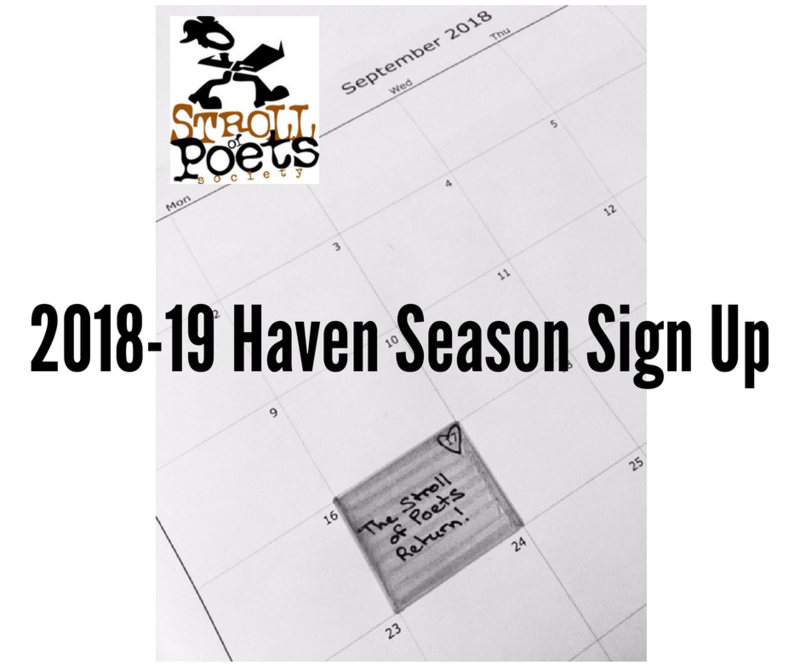 Come and play with the Stroll at the launch of our 2018-19 Haven season! Make it musical — bring an instrument (or a friend with one). Or come as a band! Come with a painting that inspires you or a poem about playing! It will be an all evening open mic so get your game on! Monday, September 17th, 7pm at the Upper Crust Cafe. 2018-19 Haven Season is here! The 2018-2019 Haven season is a month away! Penned some new poems for a ten minute reading? Want to hone those mic hosting skills? Or greet guests as a Haven Door Host? The Haven sign up page is open to schedule your reading or to volunteer. All Stroll members are eligible for a ten minute reading. Want to be a member or need to renew your membership? Learn more here. 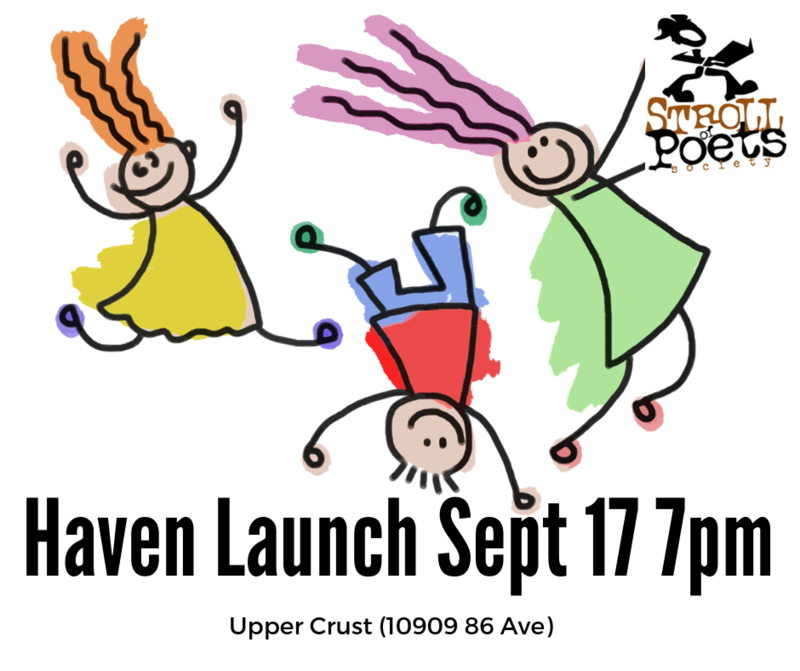 The Haven launch will be Monday, September 17th at 7:00 pm at the Upper Crust Cafe (10909 86 Ave). More details to come! The ground is prepped for the sonic and popping word combs of Edmonton’s next generation of poets! 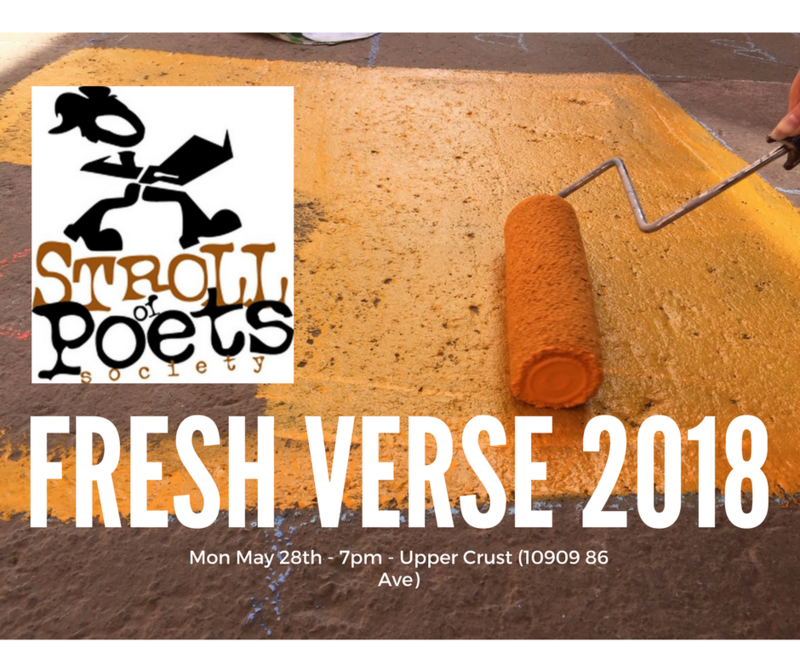 The Stroll of Poets invites you to the sixth edition of Fresh Verse where we again profile poets under the age of 25. We’re looking forward to featuring 8 poets who will each have a five minute reading. We’ll also have a two minute open mic. The event is open to all! Made Ya Blink! 30 Second Poems are Back! It’s eye-to-eye and word-to-word-year 12 of Edmonton’s famous Blinks. 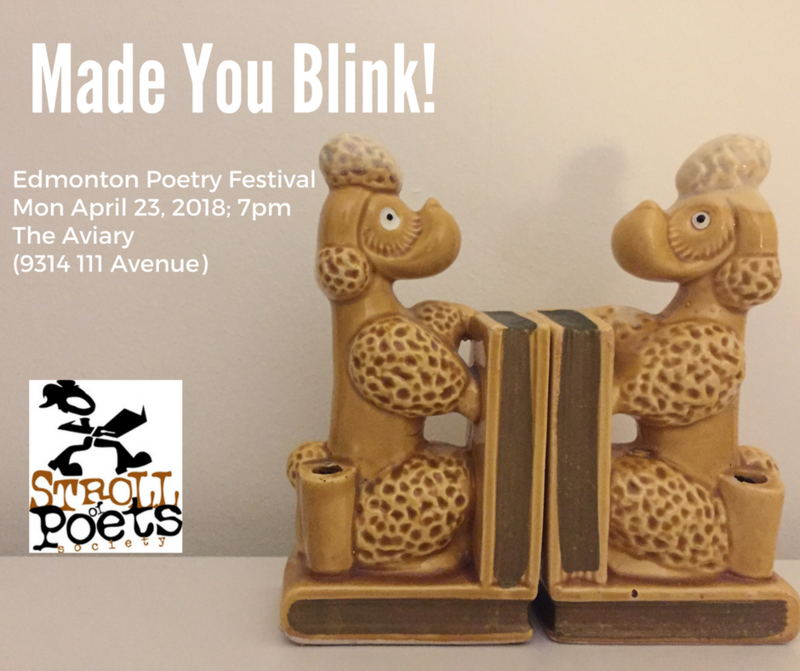 As part of the Edmonton Poetry Festival, it’s a night of 30 second poetry and the friendliest stare-down you’ll ever be part of – whether you deliver a poem or come for the vibe. It’s free to attend and free to read. For more information or to sign up, visit the Edmonton Poetry Festival website. The Magpie Poems chapbook has taken flight and 15 of its contributors will be reading at a special event at the Wild Bird General Store (4712 99 Street) on Sunday, April 15th from 1-3pm. All are welcome to attend! There is a $5 donation at the door and light refreshments will be available. 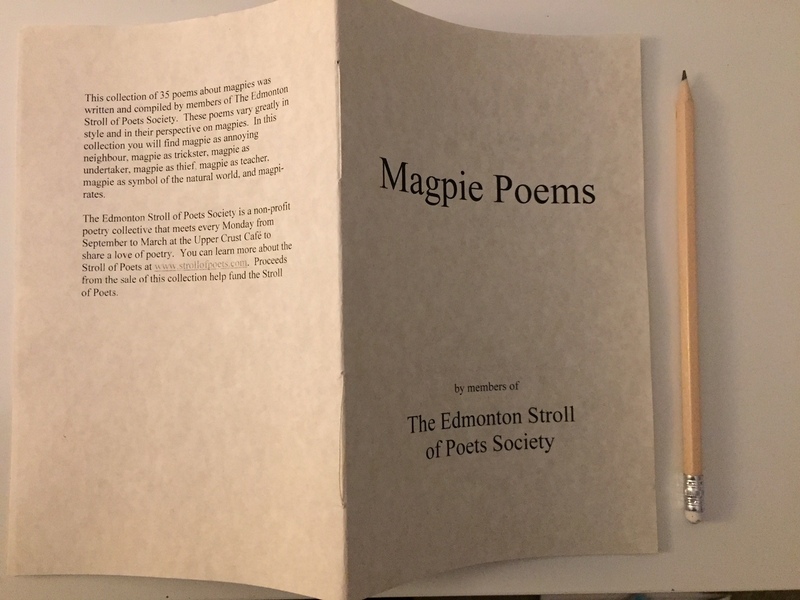 The chapbook is a collection of 35 poems about magpies written and compiled by members of the Stroll. Proceeds from the sale of the chapbook help fund the Stroll of Poets.